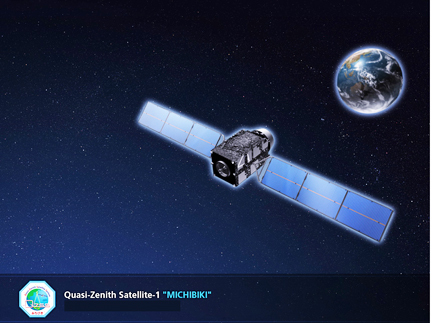 [SatNews] The Japan Aerospace Exploration Agency (JAXA) has controlled the orbit of the First Quasi-Zenith Satellite "MICHIBIKI" to insert it into the quasi-zenith orbit from the drift orbit starting on September 21st (Japan Standard Time, JST). The final orbit control operation was performed for about 50 seconds from 6:28 a.m. on September 27 (JST.) After the operation, JAXA confirmed the satellite was successfully injected into its preordained quasi-zenith orbit with its center longitude of about 135 degrees through the orbit calculation, whose results are shown in the following table. JAXA will carry out the initial functional verification of the onboard mission devices in cooperation with organizations1 that perform technological verifications for about three months. Drift orbit — The last step orbit prior to the quasi-zenith orbit. The orbit altitude and inclination (angle against the equator) are equal to those of the quasi-zenith orbit, but the longitude of the center of the figure-8 orbit is not above Japan. After being injected into the drift orbit, it will take a few days to maneuver the satellite to have its figure-8 center above Japan, thus it will ultimately fly in the quasi-zenith orbit. Quasi-zenith orbit — While the quasi-zenith orbit has the same orbit period of 23 hours and 56 minutes as the geostationary orbit, it can let a satellite stay over Japan longer by taking an elliptical orbit with higher altitude above Japan and flying in a figure-8 orbit.